Preheat the oven to 130°C/275°F. Whisk the egg whites in a spotlessly clean grease-free bowl until stiff peaks form. Add the sugar gradually, continuing to whisk all the time until the mixture is glossy. Use 2 dessertspoons to shape the mixture into ovals and place on the baking parchment to make 12 meringues. Bake in the oven for 1 hour until the meringues are golden and come away from the paper. Leave them in the oven to cool to allow them to continue cooking until they dry on the outside, leaving a delicious chewy centre. Whip the double cream until thick then stir in 1 tablespoon of sugar. Add the lemon curd and fold in loosely to create a ripple effect through the cream. 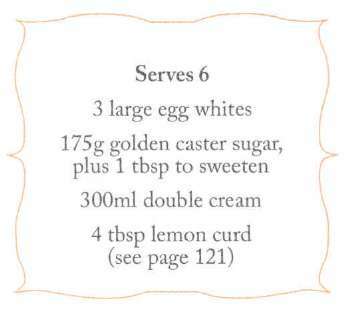 Spoon the cream mixture into a serving bowl and serve alongside the meringues for everyone to help themselves.